Stayed one night before our flight in an aspire family room with runway view. 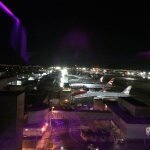 Fantastic room and loved watching the planes, easy valet parking and excellent service especially by Karolina and Elena. I'm so pleased to see all your positive remarks about your stay here with us at BLOC Hotel Gatwick, thank you very much for taking the time to post such an excellent review. Karolina and Elena are integral to our hard-working Reservations team and I know will be thrilled to get a special mention which I'll be sure to pass back to them. We do cater specifically for families at BLOC and have two different room types that are particularly suitable, containing our bespoke King-sized bed as well as bunk beds. Of the two different types, the Smart family room and the Aspire family room, the Aspire is the more spacious at 16m. sq., has extra-large corner windows over-looking the runway, a work station and a chaise longue, so this is likely to be the best choice if you have two active teenagers travelling with you! Your five-star review is much appreciated and I do hope that BLOC can go on to be your number one hotel of choice at Gatwick. I actually stayed here after a late night arrival rather than departure. The reception is just a few steps from the departure security gate though! Isn't exactly far from arrivals, just on a different floor. You check in at a fancy reception desk and are given your key. My room was on the 8th floor I think so a few floors up. My room wasnt massive but perfect for someone who just wants a shower then a sleep after a late arriving flight. Next to my bed was a tablet from which I could control the temperature (awesome as I hate to be hot when sleeping) and also the lights. The shower was in a wet room. Decent water pressure and shower gel was provided. Bed was amazingly comfy, I didn't hear a peep from outside the room and after what felt like three minutes my alarm was going off an it was time to get up! Great location, comfy beds, quiet room. Perfect! Already booked my next stay! Many thanks for such a wonderful review, I'm so pleased that you had a wonderful night's sleep and were surprised by your alarm going off in the morning! BLOC is in a great location for both Arrivals and Departures and guests stay both before early-morning flights and after late-night flights. As you point out, we're literally right next door to Departures and only a short walk from Arrivals, so equally convenient for both. Our rooms are designed to offer everything that you might need for a stopover at Gatwick and to that end we've prioritised the most comfortable, bespoke, King-sized beds and powerful monsoon showers, probably the two most essential requirements for setting off on your travels again relaxed and refreshed. It's obviously wonderful to know that you've already booked to stay with us at BLOC Hotel Gatwick again and we look forward to welcoming you back then. 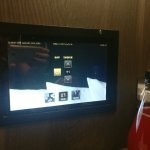 Normally the electronic key cards don't work in other hotels, but this place actually worked . Thank you very much indeed for such a lovely review of your stay with us at BLOC Hotel Gatwick. It's a real pleasure to be described as 'faultless' and that everything at BLOC proved to be exactly what you needed before you set off on your long-haul flight. We were delighted to be able to upgrade you to a room with a window, they are available to pre-book if this is something that appeals to you, rather than going for our most budget-conscious windowless rooms. Our Reservations team can always give you information to help you make your choice if you're unsure as to the room type that will suit you best. It's fantastic to receive such positive feedback and we hope that BLOC Hotel will continue to offer you the best place to stay at Gatwick for future trips abroad. 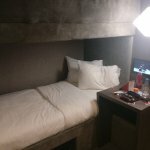 I stayed for one night at Bloc after landing into the South Terminal fairly late, I was then hopping on another flight at 9.00 am the following morning. I've stayed at a few Gatwick Hotels before, but its the usual hassle of leaving the terminal and catching a bus or taxi to where you are staying. 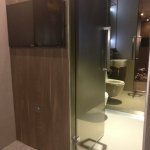 Anyway the rooms are small but clean and very modern in design, the rainwater shower was great, the bed super comfy and the touch pad to dim the lights and operate the window blinds was awesome! I booked early so got a great price, when I'm flying from the South Terminal again I shall be paying another visit! Many thanks for your great review after your recent stay here at BLOC Hotel Gatwick. You're so right about the ease of staying here compared to other hotels around the airport. Because BLOC is situated within the terminal building itself, everywhere that you might need to get to is only a short walk, undercover, no requirement for taxis, buses or transfers. The lift takes you up from the main concourse area straight to the BLOC Reception area where we'll check you in as quickly as possible so you can spend the maximum time in your room, and the least amount of time on getting there! I'm absolutely delighted to see that you'll be back to stay at BLOC next time you're flying from the South Terminal and we'll look forward to welcoming you back then. Thank you for having chosen to stay with us at BLOC Hotel Gatwick and for taking the time to post a review. I'm pleased that you felt the photo of the room you were staying in was absolutely accurate so you knew exactly what you had to look forward to before you arrived here at BLOC. You were staying in one of our standard Sleep rooms, if you did want a more spacious room, with a more traditional layout and only the head-end against the wall, take a look at the BLOC website at alternative rooms such as the Aspire or the VIP rooms which may suit you better. Many airlines do now allow you to check your bags in the night before if you have an early morning flight, so you're right, if you can get them checked-in when you get to Gatwick, you can get from your room at BLOC to security for Departures in only a couple of minutes, a wonderful, relaxed start to your trip. I hope you had a fabulous time in America and we hope that you'll decide to return to stay here at BLOC Hotel Gatwick again in the future. Me and my husband stayed here on the way out for our holiday, and then on the way back too. It's so convenient! Outbound we had booked a double but asked if we could upgrade when we got to check in. We did, at a very reasonable price, so we had the room with the dual aspect windows. It was fab. great bed and pillows and a super shower. View of the apron and runway but very little in the way of noise. I think people have been moaning at the lack of window in their rooms, but if they pay attention to what they are booking, it does say, it's a windowless room so if you need a window-look at what you're booking! On the way back from our holiday, it was a long haul, overnight flight, and arrived into Gatwick at about 1100. Our next flight wasn't until 1810, so we booked a day room. Hanging around an airport terminal with jetlag is no fun, so this was perfect for us and I would thoroughly recommend having a day room. The hotel is very clean, very modern, and just perfect for weary travellers. Book, you won't be disappointed. What a fabulous review, thank you so much! I'm really pleased that we were able to accommodate you at both ends of your holiday and that you loved the room that you upgraded too. We do work very hard to accurately describe the different room types that we're able to offer here at BLOC and you're right, it is a shame when guests arrive having booked a windowless room (at very budget-conscious prices), to then be disappointed that they're in a windowless room! We hope, however, that as time goes on guests will have done their research thoroughly and will end up in a room that's ideal for their requirements, as you did! BLOC is able to provide rooms for a day-let where you have a layover between flights, as you say, perfect rather than hanging around in the airport suffering from jet-lag, being able to sink into a lovely comfortable bed and refresh yourself with our fabulous monsoon shower. I'm really thrilled with your recommendation 'Book, you won't be disappointed' and we very much look forward to your return to BLOC Hotel Gatwick in the near future.